Heat a knob of butter in a large skillet over low heat and sautée the onion for 2 minutes, until softened but not browned. Turn the heat slightly up, add the rice and toast until translucent, about 2 mins. Pour in the champagne and let the alcohol evaporates, stirring once or twice. Keep cooking the risotto, stirring continuously, by adding a ladle of stock when needed. Cook for about 15 min. 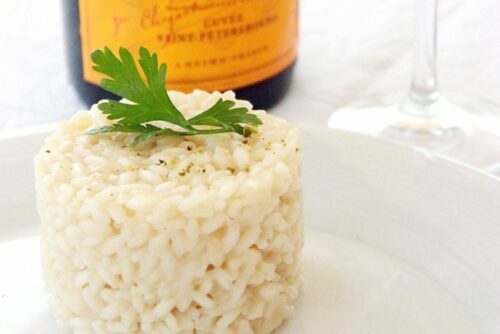 When the risotto is almost ready, stir in fresh chopped parsley. Take the pan off the heat and add grated Parmesan and the remaining knob of butter and sttir until you reach the perfect creamy consistency. Season to taste, sprinkle with freshly grated lemon zest and serve.